Runaway children who meet up with monsters. A giant talking bug. A secret world of mouse-people. The stories of Franz Kafka are wondrous and nightmarish, miraculous and scary. 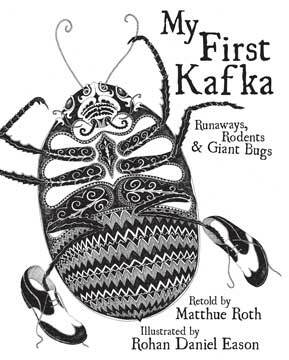 In My First Kafka, storyteller Matthue Roth and artist Rohan Daniel Eason adapt three Kafka stories into startling, creepy, fun stories for all ages. With My First Kafka, the master storyteller takes his rightful place alongside Maurice Sendak, Edward Gorey, and Lemony Snicket as a literary giant for all ages. Matthue Roth is a writer and video game designer. His first novel, Never Mind the Goldbergs, was nominated as an ALA Best Book and named a Best Book by the New York Public Library. He co-produced the irreverent animated Bible series G-dcast, and his screenplay 1/20 was produced as a feature film. He lives in Brooklyn with his wife, the chef Itta Roth, and their children, and he keeps a secret diary at www.matthue.com. Rohan Daniel Eason studied Fine Art Painting in Kingston, London in 2000. On graduating he turned to fashion, creating fabric prints and concepts for Italian designer, Annette Olivieri. Rohan creates images for editorial media, publishing, and advertising. He is the illustrator of Geoff Cox's Anna and the Witch's Bottle and James Palumbo's Tancredi. Rohan was featured on the front cover of Design Week, August 2009 and was included in The Artisan, a Thames and Hudson publication by Olivier Dupont, on the top 100 new artists and makers in the world. Rohan presently lives in London, England.